To ensure programs of study are high-quality, they must be comprehensive, rigorous and prepare learners for opportunities in high-skill and in-demand fields. Connections with local employers is also important so that learners participate in meaningful work-based learning experiences. Business leaders provide input on the curriculum and the benefit of participating is building a pipeline of high-wage, in-demand careers in their own community. 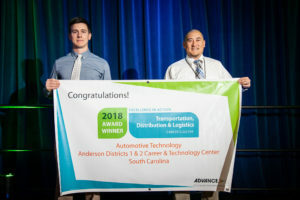 For example, the development of the Automotive Technology program of study – a 2018 Excellence in Action Award winner in the Transportation, Distribution & Logistics Career Cluster®, housed at Anderson 1 and 2 Career and Technology Center in Williamston, South Carolina – is the direct result of industry needs in the community. “We believe in project-based learning, engaging businesses and industries, setting high expectations for all students and creating student-centered classroom environments. We have embraced the integration of academics into Career Technical Education. Our programs work closely with our home high schools and postsecondary institutions around career pathways that give students a head start on high-demand employment opportunities thought stackable credentials,” said Kale Fortenberry, Automotive Technology Instructor. There are more than 200 major manufacturers and 20 international companies located in Anderson County, including a number of car manufacturers.The high industry demand for skilled workers has led to employers reaching out directly to the program of study to build a pipeline of qualified and skilled employees. For example, the BMW Performance Center continues to serve as a business partner. Product Specialists at BMW bring BMW’s newest vehicles to the school so learners can gain first-hand industry knowledge. “The quality of this program, its equipment and the instructor set the standard in our area. During our visits, we are continually impressed with the quality of students this program produces. Students show a level of professionalism that indicates their readiness for higher education and the workforce,” said Jonathan Stribble, Product & Delivery Support Specialist, BMW Group. In their junior and senior years, learners may participate in the cooperative education option. This paid work-based learning experience includes a written training and evaluation plan, developed with industry partners, that guides workplace activities in coordination with classroom instruction. Students receive course credit in addition to financial compensation with the ultimate goal of providing a seamless transition into the workplace or postsecondary education. Through an articulated agreement with the Tri-County Technical College, beginning their sophomore year, learners can earn up to 15 college credits as well as 10 industry-recognized certifications in electrical and braking systems. In the 2015-16 school year, 99 percent of students earned an industry-recognized credential and 73 percent earned postsecondary credit. Learn more about the Automotive Technology Program at Anderson 1 and 2 Career and Technology Center and our 2018 award winners. For all learners to experience success, the systems and stakeholders that surround them must work together. To accomplish this, there should be alignment across secondary and postsecondary education, workforce, community-based organizations, and business and industry. 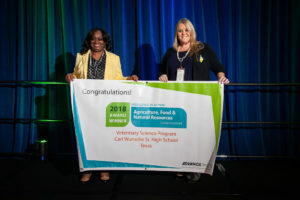 An example of what can be achieved when this cross-sector collaboration occurs is the 2018 Excellence in Action Award winner in the Agriculture, Food & Natural Resources Career Cluster®, the Veterinary Science Program housed at Carl Wunsche Sr. High School, in Spring, Texas. “The students, school district personnel and business partners have worked tirelessly to make the Veterinary Science Program one that produces students who are educated, informed, prepared, and equipped with the knowledge and skills to begin their career in the field of veterinary medicine and/or agriculture or pursue postsecondary education,” said Jessica Graham, M.Ed., LVT, Veterinary Science Teacher. Recently, she received the Outstanding Early Career Alumni award from Texas A&M University. This four-year program offers a rigorous sequence of academic and technical courses. The established partnerships create opportunities for learners to graduate with college credits and state-recognized certifications. For example, the College of Veterinary Medicine at Texas A&M University is one of the postsecondary partners offering a direct pathway from high school into a degree program. Additionally, the Veterinary Science Program offers 17 Advanced Placement courses, which articulate up to 30 dual credits at the Lone Star College System. Learners who are on track to earn an associate degree in veterinary technology can complete nearly half their coursework toward their degree before graduating high school. To be prepared for this industry, learners need to obtain real-world skills. The Veterinary Science Program also offers numerous work-based learning experiences with industry partners, such as the Northwest Animal Hospital, Spring Independent School District Police Department K9 Units, Critter Fixer, Aldine Animal and My Family Vet. Northwest Animal Hospital in Houston, TX, allows learners to observe and participate in small animal live surgical demonstrations in the veterinary surgical suite at the pet clinic located on the high school campus. The clinic itself also demonstrates cross-sector collaboration. Community members can see Career Technical Education at work by bringing their own pets in for care, and learners gain real-world skills by providing affordable and quality pet care to the community. Services include basic grooming, vaccinations, monthly and yearly exams and a pet spa. There is also an outdoor area for cattle, horses, pigs and goats. The money earned through the clinic is used for student scholarships to cover the expense of their industry certification examination fees. Learn more about the Veterinary Science Program at Carl Wunsche Sr. High School and our 2018 award winners. Today is Manufacturing Day® a celebration of modern manufacturing meant to inspire the next generation of manufacturers. This day, recognized annually on the first Friday in October, features events around the world to provide a behind-the-scenes look at a growing industry. Find an event near you here. It’s a day that gives communities and learners the opportunity to explore what a career in the manufacturing field really looks like. Why is this important? According to a report by Deloitte Consulting LLP and the Manufacturing Institute, 80 percent of manufacturers have a moderate or serious shortage of qualified applicants for skilled and highly skilled production positions. This translates to nearly two million unfilled jobs over the next decade. Career Technical Education (CTE) programs of student in this area can help to close that gap by preparing the workforce of the future with the industry required skills to fill those positions. Manufacturing is also one of the 16 Career Clusters® in the National Career Clusters® Framework. Superior implementation of a Career Cluster in a program of study is one area needed to qualify for Advance CTE’s annual Excellence in Action award. The award honors high-quality CTE programs of study from across the nation. 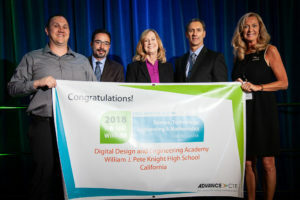 This year, the Utah Aerospace Pathways program of study at the Granite Technical Institute in Salt Lake City, Utah received the award in the Manufacturing Career Cluster. This program of study was established in 2015, in response to industry demand for skilled employees in aerospace careers. In that same year, the Utah aerospace industry accounted for 944 companies.The Utah Governor’s Office of Economic Development, five local aerospace industry partners and secondary and postsecondary institutions, worked closely to develop the robust program to address this growing need for a skilled workforce. It is one of the four Utah Talent Ready Initiative programs, which aims to fill 40,000 new high-skill, high-wage jobs in Utah over the next four years. In May, 55 learners graduated from the program of study with certificates in aerospace manufacturing. To receive this certificate all learners must have completed rigorous coursework and a 48-hour externship in the industry. This certificate is unique in that it guarantees an interview with any of the participating partner companies including Boeing, Albany International, Hexcel, Janicki Industries and Orbital ATK. In addition to earning a certificate, learners have options to continue their postsecondary education through an articulation agreement between the high school and Salt Lake Community College and Weber State University. Apply Today to the 2019 Excellence in Action award! Do you think you have one of the best Career Technical Education (CTE) programs of study in the nation? Advance CTE is on the search for programs of study that exemplify excellence in the implementation of the Career Clusters®, show a true progression from secondary to postsecondary education, provide meaningful work-based learning opportunities, and have a substantial and evidence-based impact on student achievement and success. Apply for the 2019 Excellence in Action award to showcase the amazing work of your learners, instructors, partnerships and faculty at the national level. Not only will your program be featured in the media and an awards ceremony in Washington, D.C. in the spring, you’ll also be contributing to a positive image of CTE programs. In its sixth year, this award showcases innovative programs of study to policymakers, employers and education leaders and lets them know that CTE is for all learners and prepares them for a lifetime of college and career success. Applications are open to secondary and postsecondary schools/institutions. Apply today!